My friend Angela Roberts has an amazing food blog called Spinach Tiger. You have to go check it out because it has so many awesome recipes with beautiful photos that will make you drool. She has a knack for taking recipes that can be intimidating and making them very doable. I am so excited because she agreed to create recipe to share with just my lucky readers. Yay! I love her food and I am sure you will too. Today, she is going to share some fabulous tips with us on how to freeze soup and her very own recipe for Bean Soup with Ham Bone. 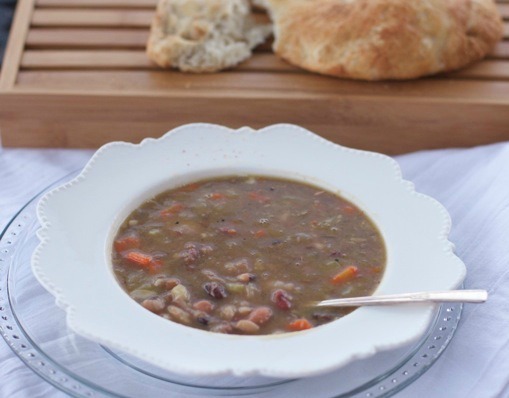 Can you freeze bean soup? Yes, just follow these simple steps on how to freeze bean soup and you will have some on hand for any occasion. 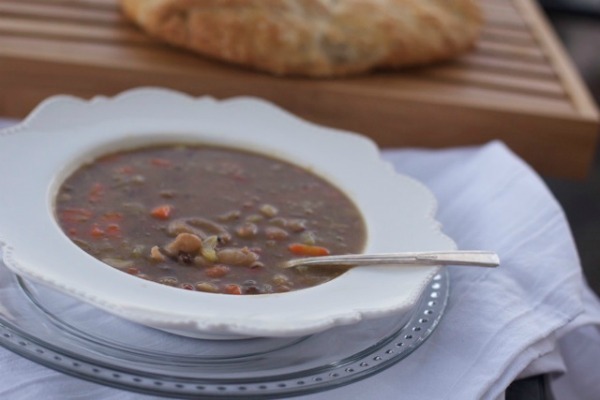 This bean soup is that perfect hearty, winter soup that will serve as a whole meal. It’s made with the left over ham bone, and a bag of beans with 13 varieties. You can use one type of bean if you prefer, such as a navy or great northern bean. The ham bone was left over from Christmas dinner and put into the refrigerator. It was a rather large bone still containing a good amount of ham, which was used to cut up and put back into the soup. If you don’t have these kinds of beans or a ham bone, I’ve put substitutions in the recipe. The most important part of making a good bean soup is to use good quality dried beans, and to soak those beans overnight. Once they are soaked and rinsed, I cook them with a little garlic, and half onion, simmering for up to two hours until the beans are tender. This technique makes the beans more gentler to eat, easier to digest. Make sure not to add any salt until the beans are cooked. The soup making process begins with placing that big ham bone into a large pot or slow cooker with carrots, celery, onion and some fresh herbs. A little parsley, thyme and rosemary (or any combination) adds a nice layer of flavor. The ham bone will create its own broth. Some people will add in chicken broth and you can do that, but I found it not necessary. I added the drained cooked beans, salt and pepper and cooked on low for 6 hours. You could cook on low on top of the stove for about two hours. I found the long slow cooking created a very creamy soup. If you’re soup isn’t creamy enough, you can remove some of the beans and blend them and put them back in the soup. Can I Freeze Bean Soup? I always make an extra large pot so I can freeze some for a cold, or snowy day. Freezing bean soup is so smart in the wintertime and bean soup freezes really well. 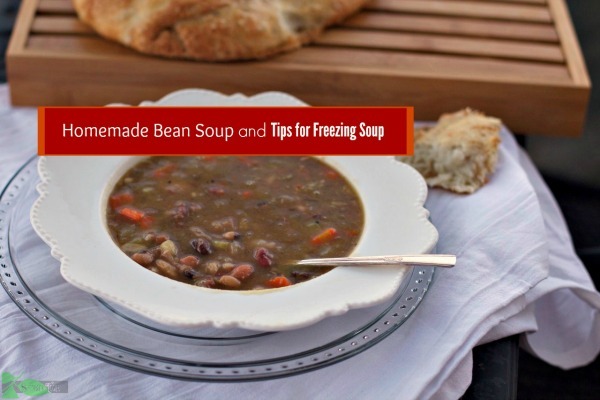 Here are some tips for how to freeze soup and they work great for freezing bean soup with hame bone as well. Avoid freezing potatoes or pasta in a soup. They can get grainy or mushy. If you are going to add these ingredients to your soups, add them as you serve them, and when you defrost the soup. Cool the soup completely. This is true even when just refrigerating. Hot soup will bring your internal temperature down. To hasten the cooling, place a bowl of hot soup over a larger bowl containing ice. Use either plastic snap on containers or plastic freezer bags, making sure to leave room for expansion (at least one inch). If using freezer bags, lay them down flat, making sure to get as much air out as possible. Place on a tray inside the freezer, so the bags will freeze flat and will be stackable. You can freeze soup in mason jars, providing enough room for expansion, 2 inches or more. The general recommendation for freezing soup is up to three months, but I have found I can freeze soup for up to six months. Defrost, by placing in freezer, or place plastic bags or container in a ice water for a quicker thaw. It’s not recommended to microwave the soup in the plastic containers or bowls. Reheat soup in a pot, not a microwave for even heating. At this time, you can in cooked cubed potato or cooked pasta. I hope you find these tips for how to freeze soup useful! Heat olive oil in a heavy bottomed pan. Add onions, carrots and celery and saute briefly, just to soften the onion. Add garlic for one minute. If using this pot for your soup, add in hambone, herbs, and cold water. Season with salt and pepper, but gently on salt if your ham bone is salty. Heat to boiling, reduce immediately and skim off any foam. The heat should remain on simmer. Add beans and cook very low heat for two hours or until the bean soup looks creamy. Remove the herbs and discard. Remove the ham bone and cut off any pieces ham, discarding any fat and put back into the soup. If the soup is not thick enough, remove a cup of the cooked beans and blend in blender and add back into the soup. Season again with salt and pepper to taste. Serve sprinkled with fresh parsley. Soak the beans overnight or at least six hours with cold water, 3 inches past the beans. Discard the beans that rise to the top and rinse. Soup is best served hot, but often I will add ice cubes to the kids’ bowls. Grated parmesan cheese is a great addition for perking up a soup, as is croutons, crackers, or crusty bread. 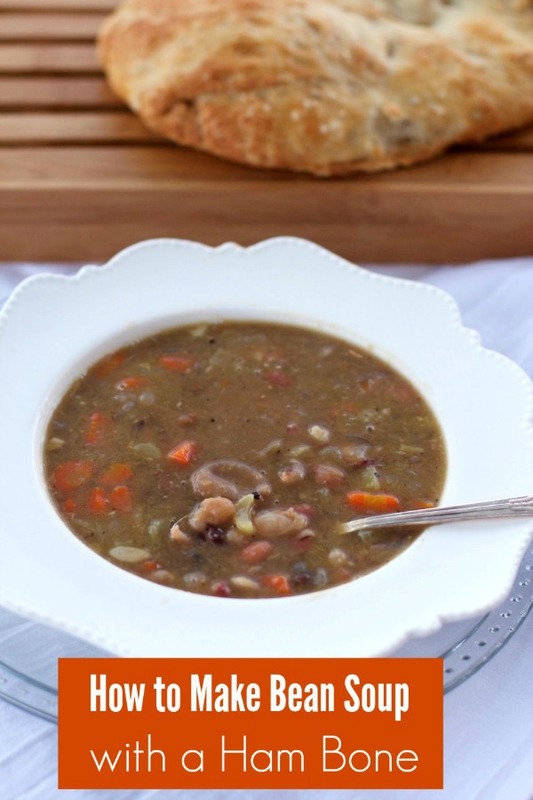 I hope you enjoy this bean soup and ham bone recipe and the tips on how to freeze soup. Follow SpinachTiger on Twitter or Pinterest to see more great recipes! I’ve been making sooo many things with beans this Winter. Now that it is officially snowing in Nashville, this will fit in perfectly. Angela’s recipes always turn out great for me!